What are comets? 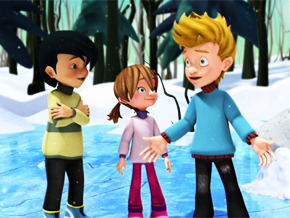 ‐ Jack’s plans to enjoy a fun ‘snow day’ with the kids backfires when a large comet is reported heading for Beano. Jack hopes that this could mean a new posting to Earth, but to his dismay, HC says forget it… Jack’s getting a desk job at HC so she can keep an eye on him. A horrified Jack must destroy the giant space snowball before it destroys his freedom. How drastic climate change affects the eco‐system? Sick of the endless winter on Earth, Jack creates a large dome‐shaped force field and cranks up the heat. But when the dome overheats, Jack must find a way to get rid of it and restore nature’s balance before the now‐thawed trees and bushes are killed off. How does a remote work? Chip bonds with an old robotic toy of the kids so the kids suggest Jack take the toy home with him… not realizing that Mom has put the toy aside for Mrs Weebler’s charity drive. In order to get the toy back, Jack rigs up a new remote control… which unfortunately can control just about every other electrical device on the street too. Why does poison ivy itch? After Jack experiences the effects of poison ivy, he decides to collect as much as poison ivy in the woods as he can, to get rid of it in order to protect the kids; not realizing that the active oil in Poison Ivy is extremely potent, and Jack’s collected enough of it to contaminate the entire planet… and Mom’s about to spray the garden with it.